One of my favorite research topics while investigating my family tree is learning more about my Prince Edward Island (PEI) ancestors. This Canadian province captured the hearts of my ancestors, particularly my grandfather Michael Doherty. My dad would often tell us stories of heading in the car with his parents and siblings from Long Island in New York up the coast to PEI to visit cousins. The Doherty* family originally came from County Monaghan, Ireland. The earliest record I found for this line was in the parish registers recording the marriage of my great-great-great-grandparents Francis Dougherty and Catharina Clarkin in Tydavnet on 14 February 1829. Francis and Catharina had four sons and then moved in 1839 to Prince Edward Island. Five daughters were later added to the family. Francis was a farmer and bought 100 acres of land from the Earl of Selkirk. The family attended church at St. Michael’s Church in Iona and St. Joachim’s in Vernon River. Instead of taking a lovely vacation to Charlottetown, I can review the church records here in Boston. Over the past year I have been reviewing the parish church registers on microfilm here at the NEHGS library. The parish registers are largely microfilmed from the Public Archives of Prince Edward Island office (otherwise known as PARO). Instead of taking a lovely vacation to Charlottetown, I can review the church records here in Boston. The records include baptisms, confirmations, marriage records, and burials, and are organized by individual church. The church records allow me to trace the family and the close connections they had with other neighboring families, especially when vital records are difficult to obtain. Note: Civil registration for births and deaths began in 1906. 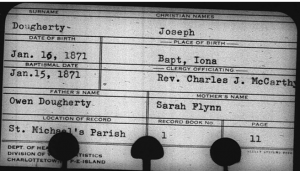 During my research, I came across the baptism record for Joseph Doherty, my paternal great-grandfather (Michael’s father). He was born at Iona 10 January 1871, and was baptized at St Michael’s. His parents were Owen Dougherty and Sarah Flynn. Owen was Francis’s third son. I strongly recommend consulting the original church records. The baptism index card on file at the Vital Statistics Office in Charlottetown did not list the correct clergyman performing the baptism – it was Rev. James Phelan. not Charles McCarthy (who actually recorded the baptism). In addition, the sponsors were not listed, which are usually family members. Joseph’s baptism sponsors were James Mullin and Susan McKenna. These two families are intertwined in my family tree. In addition to reviewing the baptism records, I also like to review the marriage registers. I looked for one of the children of Francis and Catharina, Catherine Dougherty (my great-great-great-aunt) who was born on 27 May and baptized at St. Joachim’s in Vernon River 11 June 1849. I reviewed the marriage registers digitized by FamilySearch from PARO and was not able to find her marriage in the index. I had a lead from an unpublished genealogy that she married a Cullen. St. Michael’s marriage register record for John Cullen and Catherine Doherty. I reviewed the St. Joachim’s church marriage register and did not find this couple. I then looked at St. Michael’s church records to see if maybe they got married there. I was able to locate a Catharine Doherty and a John Cullen marrying on 6 September 1874. She is noted as living in Iona parish, which matches up with what I’ve found for the family. Catharine’s parents are listed as Francis Doherty and Mary Clarkin. This leads to further questions: Who is Mary Clarkin – did the priest make a mistake for the mother’s name? Was it simply a nickname? Did Catharina die and Francis then marry a sister of hers? Church records are invaluable as vital record substitutes and can help sort out the family stories passed down through the generations. I hope that if you’re ever in the Boston area you have the opportunity to check out our valuable collection of Prince Edward Island parish church records. Church records are usually helpful when they’re available. I’ve had some success like yours, Ms. McComb, looking up pre-1921 records from Wisconsin on Family Search, mostly baptisms and marriages. They are not indexed, but findings often lead to more clues about links between families. I recommend using the keyword search for town and church name. This is a good example of how church records can be used to create a comprehensive extended family tree. My mother’s father was born in Austria and her mother’s family were from Bavaria. Various cousins either hired professional genealogists in Germany and one who can read German researched the records on her own. All reached the same conclusions based upon an examination of Catholic parish records. Incredibly, parish records kept in Oberstreu, Bavaria survive today starting before the 30 years War that began in 1618 and devastated Bavaria along with all the subsequent wars. 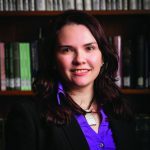 I usually advise people to hire professional genealogists in Germany to examine parish records given the language difficulties and sometimes limited accesibility of these records because of disputes between the Catholic Church and the Latter Day Saints over baptismal practices. I THINK my family has roots in PEI. I am still trying to confirm. When I was a wee lass we started out for a vacation in Florida after the cold winter in Massachusetts. My dad, God love him, had trouble find his way out our driveway (Directionally challenged) finally decided we were right about his misdirection when we passed the Canadian border! We wound up in Nova Scotia and then on to Price Edward Island. We always laughed about dad’s lack of directional sense but we sure enjoy that beautiful vacation. I have a revisit to Canada n my bucket list. It’s a beautiful country! I have PEI ancestry as well Melanie, and the records can vary from great to terrible, but the family histories, township histories, and oral histories have filled in many blanks for me. If only I was near enough to search through the records!! My elusive ggrandfather, Daniel D. Ward said in every census he was b. PEI 1804. I hope to find his parents for sure before I die. I have suspects but no paper that names all three of them. I’d even settle for one parent/child!! Perhaps her name was Mary Catherine? Many Catholic girls were named Mary but called by the middle name.